My West Coast twin, Just Another Nature Enthusiast’s take on this weeks Weekly Photo Challenge ‘vivid’. This entry was posted in Photography, Weekly Photo Challenge and tagged American Bald Eagle, bird, Birds of prey, Eagle, nature, Spring, Vivid, Weekly Photo Challenge, Wildlife, WordPress. Bookmark the permalink. Jennifer- did you stop breathing for just a moment when this happened? I know I did! 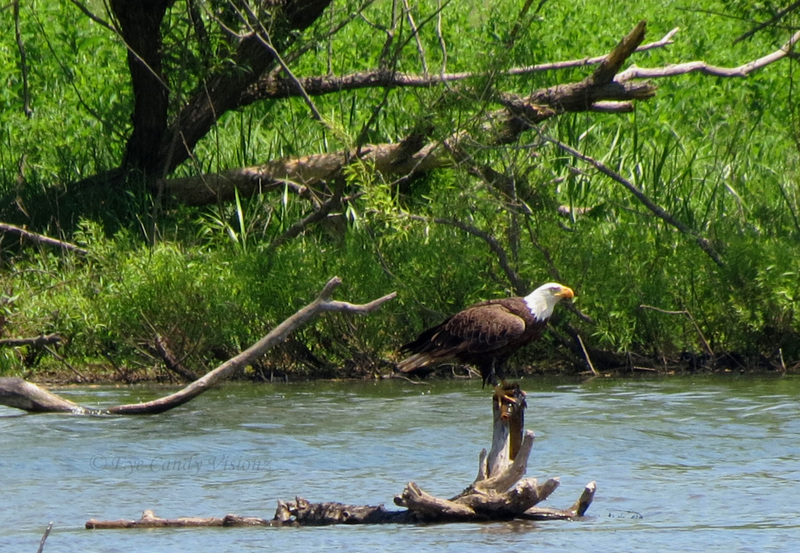 Eagles belong in trees or soaring in the skies above… not down at river level. You inspired me to post a companion to your amazing capture. I did actually stop breathing. Then my heart raced so faced I thought it would explode because the eagle took off and soared right over head, dangling his fish above me. I thought for a second he was either going to drop his fish and grab me or he was going to land on top of me. I fumbled my camera bit at that time and didn’t get that shot! That is so much like my experience… I think my reptilian brain took over in that moment of adrenaline rush to capture the shot when the eagle did a u-turn and headed back my way. I recall feeling like a puddle of jello there in my kayak when the reality of what had just happened set in. It’s easy for me to feel every moment you described about your reaction, Jennifer! BTW- what river were you on? It was actually taken from a bird observatory area off the Green Lane Reservoir. I’ve been scouting the area for a while. I’ve seen the Eagles last year in the fall I believe but they were pretty far away. I was more than thrilled to get a second chance and shot. I just realized it started “gray” not great. I am glad you understood what I meant.